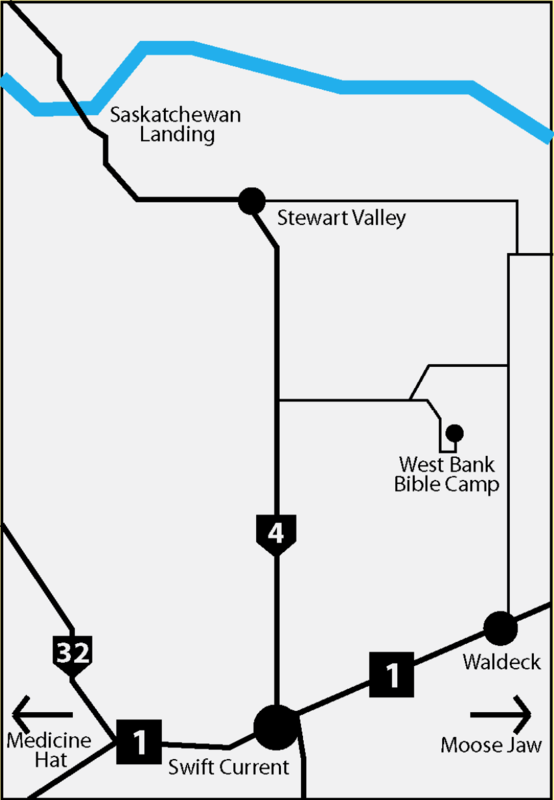 West Bank Bible Camp was opened in 1944. The camp was held near Seventeen Mile Bridge at the Apostolic Church camp. Leo Janz was the manager and speaker and Mrs Helen Dyck was the cook. In 1945, the camp was re-located north along the Swift Current Creek, at the Stewart Valley Bridge. At this location a number of cabins were built on rented land. That fall, the committee started looking for a more permanent site. The land for the present site was donated by Eugene Martens, and in spring 1946 the camp officially relocated. Rudolph Wirsche was asked to be the manager, and John Siemens from Main Centre came with his tractor to move the buildings. They moved three cabins and a few other buildings. An old tent that the Saskatchewan District Churches has used for conferences was given to the camp. It was used as the auditorium. Next a kitchen was built, along with a building for married couples to stay in. As time progressed an office and more cabins were added. Rudolph Wirsche was manager for six years. Then Eugene Martens was asked to take on the position. He was the manager for eighteen years. Throughout the years, West Bank Bible Camp has ministered to many children and families. Facilities have continued to be built and upgraded, men and women of God have continued to serve, and the Lord has continued to bless. We are grateful for the men and women that believed that the Lord would use this camp to bring many into the Kingdom. There are a few options to get to the camp. We are located 20 minutes North of Swift Current. From Swift Current, head North on highway 4 for 23km. Turn East (Right) at the sign and travel for 10 km. Go straight into the Martens Ranch. Follow the road and turn left onto the camp driveway. Stay on the road until you reach the main office. From Waldeck, head North on highway 628 for several km's. Turn West (Left) onto Highway 736/TWP 181. After you pass through the valley do a u-turn into the Martens Ranch. Follow the road and turn left onto the camp driveway. Stay on the road until you reach the main office.